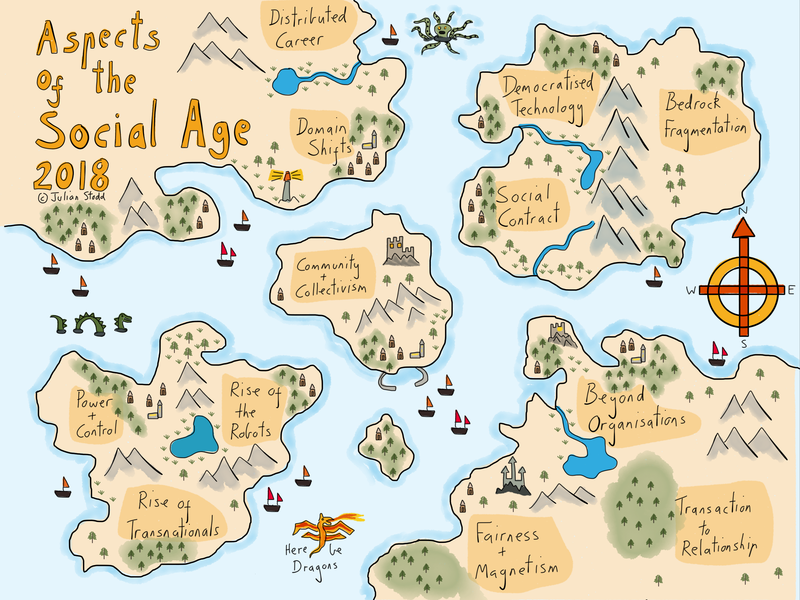 Last week i shared my new map of the Social Age, highlighting twelve core aspects of change. 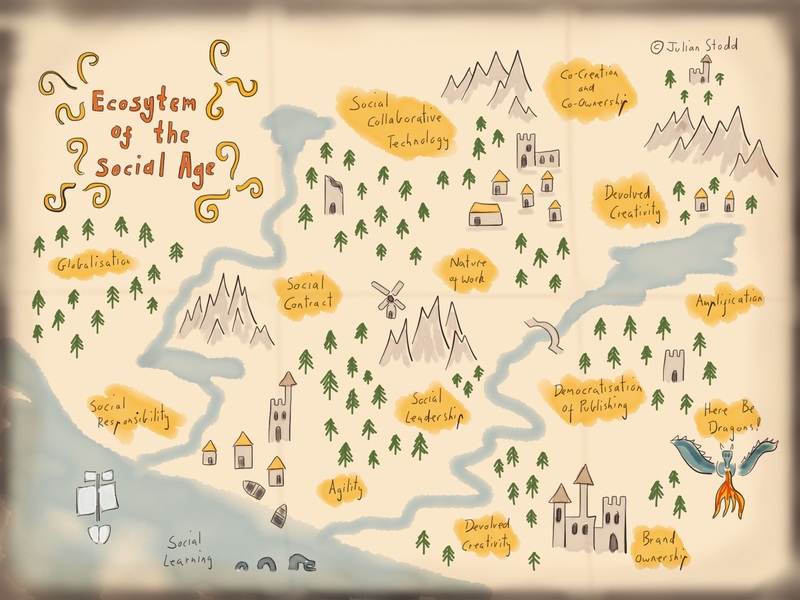 Today, for fun, i thought i would share the previous three iterations of the map, from my first sketch in 2014, where i first represented the Social Age as a landscape. 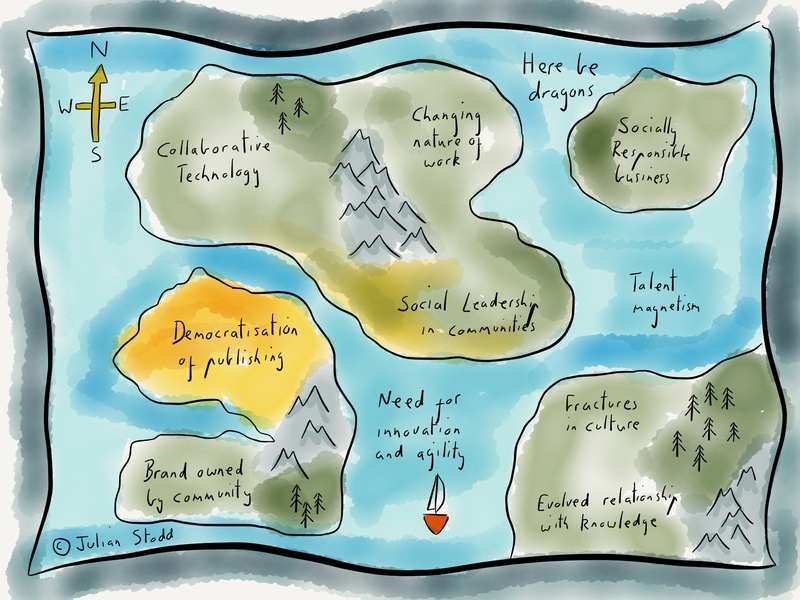 Aside from it’s rather low resolution approach, the first map identified many of the bedrocks: the changing nature of work, democratisation of publishing, and rise of collaborative technology. In the second instance, i filled in some key sections: splitting out ‘co-creation and co-ownership’, and highlighting ‘amplification’ as a core feature. This represented my own increased interest in the mechanisms of storytelling and communication in the new ecosystem. In 2016, i updated the map significantly: the island in the North East, for ‘fairness, kindness, and equality’ represented a growing realisation that these factors, previously considered ‘soft’, were now differentiators, and key to engagement. There is also more of a focus on ‘responsibility’, how organisations are grounded within their communities. Also, ‘curiosity’ made an appearance, which lead me through an exploration of just what, exactly, makes some organisations so successful? This work really led me into the notion of the Socially Dynamic Organisation, where my current exploration is based. The new map shows my current interests: firmly focussed on the ‘social’, seeking to understand how this system functions, and how it impacts. I’ve trimmed out some sections of the older maps, as some of this stuff is now so well accepted, it not longer needs a signpost. Everyone understands that careers have changed. The work on types of power (culminations of four years research and writing i’ve been doing in military contexts) and on modes of organisation (beyond organisations, transnationals etc) represent my first attempts to characterise the really broadest shifts in society, and start working towards new organising principles. My focus this year is likely to be on ‘change’, and ‘the Socially Dynamic Organisation’. How we adapt, and optimise our organisations to thrive in this new space. 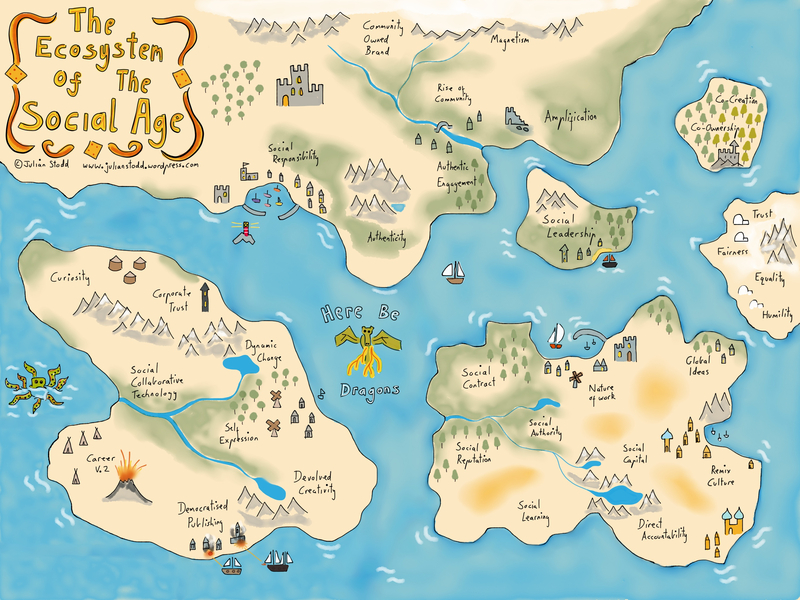 This entry was posted in Social Age and tagged Change, Leadership, Map, Social Age, Working Out Loud. Bookmark the permalink.